Angie will advocate for policy strategies to improve the efficiency, accountability, and transparency of government as well as make significant contributions towards gender equality, public health and safety, and property tax relief. 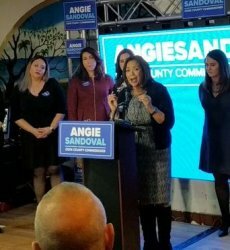 “Angie will usher in a fresh and balanced perspective of fiscal policy, while being a progressive voice for Latina health and public safety issues,” said Bridget Gainer, Cook County Commissioner of the 10th District. Angie currently works as a corporate business analyst in the Governmental and External Affairs office for Commonwealth Edison (ComEd). She has earned her Master’s degree in Public Policy and Administration from National Louis University, and a Bachelor of Science with a double major in Political Science and Gender and Women’s Studies from the University of Illinois at Chicago. Angie has a proven track record in building community. She focuses her efforts on empowering women and children, especially those of first and second-generation immigrant families. Her commitment to quality education and career opportunities for men and women has led her to serve as Vice-Chair of the National Latino Education Institute’s Emerging Leaders Board, President of the Senka Park Advisory Council in Gage Park, and on the advisory board of the Latino Youth High School in Little Village. “Angie represents a new generation of leadership on the Southwest Side of Chicago. She is one of our very own that know what’s important to immigrant and working families,” remarked Alderman Edward M. Burke. The 7th District of the Cook County Board is located on Chicago’s Southwest Side, and is comprised primarily of the Chicago neighborhoods of Bridgeport, McKinley Park, Brighton Park, Back of the Yards, West Lawn, Little Village, and Pilsen. The Democratic Primary will be held on March 20, 2018.